Although 65 treatises - either preserved or lost, but quoted by ancient authors like Bacchius (3rd century B.C. ), Erotian (1st century A.D.) and Galen (c. 129-199 A.D.) - are ascribed to Hippocrates (c. 469-c. 399 B.C.) and consist of nearly 83 books, nonetheless there is no doubt that none of them was written by Hippocrates himself. This being the fact, we cannot help agreeing with Ulrich von Wilamowitz Möllendorf (1848-1931), who maintained that Hippocrates is a name without writings! Indeed the most of the treatises of the "Corpus hippocraticum" are not the collection of Hippocrates' works, but were likely the "library" of the Medical School of Kos. The fact that it contains some treatises that represent the theories of the Medical school of Cnidos (most probably founded by a certain Euryphon, almost contemporary with Hippocrates), with which it seems that Hippocrates entered into a relentless debate, is an absolute evidence. Moreover, we must confess that, although Celsus (1st century B.C.-1st century A.D.) (De medicina, I, Prooemium) writes that "Hippocrates of Kos…separated this branch of learning (i.e. Medicine) from the study of philosophy", we have nothing to learn from the hippocratic treatises under the scientific point of view. However, whatever its origin, the "Oath" is a real landmark in the ethics of medicine and we can say - with Thuchydides (460/455-400 B.C.) (Histories, I, 22, 4) - that it is "an achievement for eternity". Suffice it to remember that every graduand in Medicine is generally still bound to take an oath that is a more or less modified and more or less updated text of the "Hippocratic oath" and that even the modern concept of bioethics has its very roots in the Hippocratic medical ethics. "The art is long; life is short; opportunity fleeting; experiment treacherous; judgment difficult: The physician must be ready, not only to do his duty himself, but also to secure the co-operation of the patient, of the attendants and of externals, " says the first "Aphorism" and the latest author of "Precepts" (chapter VI) writes: "where there is love of man, there is also love of the art", and the "art" par excellence is medicine! These precepts go surely back to Hippocrates's moral teaching. 1) which is the date of it"? 2) Is it mutilated or interpolated? 3) Who took the oath, i.e. all the practitioners or only those belonging to a guild? 4) What binding force had it beyond its moral sanction"? 5) Last but not least: was it a reality or merely a "counsel of perfection"? In this article we have gathered and discussed all the available and most important sources, but do not presume to have solved all these problems and confine ourselves to proposing some reasonable hypotheses and letting the readers evaluate the positive and negative points of our proposals. Although we must agree with W.H.S. Jones that about the so-called "Hippocratic Oath", as well as about nearly all the treatises of the "Corpus Hippocraticum" the honest inquirer can only say that for certain he knows nothing,  nonetheless we can at least propose some reasonable hypotheses. Socrates: Should you want to go to your namesake Hippocrates of Kos, the member of the guild of the Asclepiads, and to give him money as a fee and should anyone ask you: "Tell me, Hippocrates, who is the Hippocrates to whom you are on the point of giving a fee? ", what would you answer? Hippocrates: I would say that he is a physician. Socrates: In order to become what? Mnesìochos: No, by Apollo!, unless you swear! Euripides: What must I swear? Mnesìlochos: To save me with all means, if I would suffer from any damage! Euripides: Well then! I swear by the ether, the house of Zeus! Mnesìlochos: Is it not better to swear the oath of the guild of Hippocrates? Euripides: So I swear by all the supreme Gods! As Aristophanes' comedy was written and staged in 411 B.C., that is when Hippocrates was about 58 years old, and therefore at the height of his activity as both a physician and a master of medicine in Kos, the Greek comedian could not avoid knowing very well both his behaviour towards his disciples, the rules of his School and his teaching programme. As for Plato's (c.429-347 B.C.) statement, one can say the same, because "Protagoras" is one of his earliest dialogues and therefore it was written at most few decades after Hippocrates' death, when his Medical School was at the top of its booming. In this connection it is worth remembering that the foundation of the great "Asclepieum" of Kos at the middle of the 4th century B.C. was due largely to disciples of Hippocrates. These being the facts, we are presented with two problems: is the text of the "Oath" preserved in the "Corpus hippocraticum" just the original text of the "Oath" requested by Hippocrates to accept any new disciple in his school? If not, when and why was it reviewed, corrected and possibly interpolated? 17] abortion. But I will guard my life and my art in purity and in holiness. 27] but if I transgress and forswear myself, may the opposite befall me. to consider my teacher in this art as equal to my parents and to make him partner in my livelihood, and when he needs money, to share mine with him; to consider his offspring as equal to my brothers; to teach them this art - should they desire to learn it - without any fee and any covenant; and to impart precepts, oral instruction, and all the other learning to my sons, to the sons of my teacher and to disciples, who have signed the indenture and have sworn obedience to the physician's Law, but to none other. This means that a person, who wanted to benefit from the teaching of Medicine at the school of Kos must first of all "sign" a contract; second take an "Oath" (or most probably vice versa, as we shall see later which was just the guild), becoming a member of a restricted group characterized by an aristocratic exclusivenessn5  of the "Asclepiadae". As for the "syggraphé"(which literally means "a written contract signed by both the parties", i.e. the future disciple and the master) it was something like our school enrolment and, at the same time, something like our school regulation. On the basis of the order of the words "this oath and this indenture (or "covenant") one would expect 1) the text of the "Oath"; 2) the text of the "indenture / covenant". As everybody sees, four prohibitions follow the first positive pledge and four particular commands follow the second one. This being the fact, the fifth prohibition concerning the "use of the knife" on the one hand is absolutely out of place and does not correspond to a fifth particular command; on the other hand one would expect it not after the second pledge but before it, as well as one would obviously expect a fifth particular command corresponding to this fifth prohibition. But we shall deal with it later. At any rate Aristophanes' words "I swear by all the supreme Gods" seem something like a summary (or an abbreviated paraphrase) of the first lines of our text, and mainly seem repeating the entry "I swear...by all the Gods and Goddesses making them witnesses". C) the original text of the "Oath" was most probably: "I swear by Apollo...and by all the Gods and Goddesses...that I will use treatment to help the sick,... holding such things to be holy secrets", followed (as in many of our prayers) by the final vow: "if I carry out this oath, and break it not, may I gain forever reputation among all men for my life and for my art; if I transgress it and forswear myself, may the opposite befall me", which seems approximately corresponding to our "Amen / So be it". one thing was the "indenture / covenant", and quite another thing was the "Oath"
most probably the novice was asked to take the "Oath" before signing the "written contract" and therefore before becoming a fully entitled member of the guild of the "Asclepiads". 1) the extant text of the so-called "Hippocratic oath" isn't at all the original one! 33) there cannot be any reasonable doubt that the prohibition of "using the knife" is a very late interpolation, as maintained by Jones and by us in two former articles n6  , all the more so because the command : "I will give place to such as are craftsmen therein" is clearly alluding to specialized "lithotomists", whom none of the hippocratic treatises deal with and Celsus' passages in De Medicina, VII (26, 3, B in particular) do not speak about "specialized lithotomists" prior to Ammonius (or Hammonius), who lived and was active in the III century B.C., that is to say during the great Hellenistic period. Later it was separated from the rest of medicine, and began to have its own professors; in Egypt it grew especially by the influence of Philoxenus (flourished in Alexandria in the 1st century B.C. ), who wrote a careful and comprehensive work on it in several volumes, Gorgias (flourished in Alexandria in the 3rd century B.C.) and Sostratus (flourished in Alexandria in the 1st century B.C. )and Heron (flourished in Alexandria in the 3rd century B.C.) and the two Apollonii (flourished in Alexandria in the 3rd - 2nd century B.C.) and many other celebrated men, each found out something. The remaining part of my work relates to the bones; and to make this more easily understood, I will begin by pointing out their position and shapes and tells nothing at all about urological surgery! A reasonable answer to the second question (when and why was it reviewed, corrected and possibly mended?) needs at least three important premises. First of all neither Plato, nor Aristotle (384-322 B.C.) asked the disciples of the Academy and the Lyceum (that can be considered the ancestors of our Universities) either to sign any "indenture - covenant" or to take any "Oath", let alone to pay any fee. Neither any disciple of the Alexandrian Museum (the first real University in the modern sense of the word  ) was ever asked the signature of an indenture or the taking of any "Oath", or the payment of any fee. Galen (c.129-199 A.D.) states that he studied anatomy at the famous Medical School of Alexandria and urges the novices to go to Alexandria to study anatomyn8, but never speaks of either an "indenture" to be signed, or an Oath to be taken, let alone of any fee to be paid. In fact the about 100 research scholars and teachers housed in the Museum were supported by generous salaries granted first by the Ptolemies, then by the Roman emperors and therefore they could easily, or better they must teach for free. Third: although Erotian (a grammarian and physician, who flourished in the age of the emperor Nero (54-68 A.D.) in his "Hipporatic glossary" admitted the "Oath" to be genuinely Hippocratic, neither Celsus (1st century B.C.-1st century A.D.) nor Galen ever quote or refer to it, although Aristophanes' passage quoted above makes sure that an "Oath" had to be taken by those, who wanted to join the Medical School of Kos. After having taken the "Oath" the disciple had to sign the "indenture-covenant". 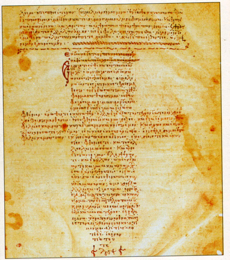 Well then: as the Alexandrian scholars knew that no "indenture-covenant" was requested to any disciple at their times (and - as said above - since Plato and Aristotle), it is likely that they considered the text as a fragment of the "Oath" and therefore inserted it just at the beginning, as well as they added books II, IV, V, and VI of the treatise "Epidemics" to the original books I and III, not to say a lot of more or less ample works that are surely spurious . But we think that it is worth observing that although more or less abbreviated Latin translations of the "Oath" can be found in a lot of mediaeval manuscripts , in all of them both the text of the "indenture-covenant" and the prohibition of "using the knife" are missing, few Latin manuscripts and a printed edition of their text excluded, as we shall state later. WWe agree with H.E.Sigerist and W.H.S. Jones n10 that the first gap may be due to the fact that the aristocratic exclusiveness its text represented was in sharp contrast with the Christian idea of universal brotherhood. mmust know the doctrines that teach us which is the human nature, which are its particular qualities, which is unhealthy state of the humours, and which is plethora; moreover he must be able to distinguish acute and dull senses; and which may be the suitable medicaments according to the nature of each patient; when he must have recourse immediately to coagulants in case of fresh wounds and when to other kinds of medicaments. Thessalus of Tralles († 79 A.D.) n9 neglected all this previous knowledge and revealed his puerility and his ignorance by relying on what even the populace knows. Indeed knowing what must be done is not important; it is important knowing how it must be done! However it seems that Thessalus ignores everything and while he thought that every bloody wound was to be treated by the same method, he smeared a pierced nerve with the drug he had often had a successful recourse to in cases of very severe wounds. By contrast he caused the formation of a phlegmon and undertook its treatment by a poultice made of wheat flour. The result was that the wound became gangrenous and he murdered this as well as many other patients in the space of six days. We think that it is possible that the mediaeval authors had at their disposal a text of the "Oath" where this prohibition was still missing. However the legitimate suspicion arises that it was still present at least in one of the Greek manuscripts, whose text was the same we read today, because the prohibition of "using the knife" and the command of "giving place to such as are craftsmen therein" is still present in 5 Latin manuscripts n7 containing a Latin translation of the Oath made by Niccolò Perotto (1429-1480)n11 and printed in Basel in 1538, as well as in the Arab translation by Ibn abī Uşaybi 'ah (1203/1204-1269/1270), whilst it is already missing in the Greek cross-shaped text of the Vaticanus Urbinates 64 (fol. 116) (Fig. 1), of the Ambrosianus B 113 sup. (fol. 203) and of the Bononiensis 3632. In this connection it is worth observing that all the authors of surgical treatises, from Lanfrancus of Milan († c.1315) to Fabricius Hildanus (1560-1634) recommend the surgeon to have recourse to the advice of a "physician" in cases of exceptionally dangerous and risky surgeries. On the contrary the insertion of the text of the "indenture - covenant" goes most probably back at least to a period between the second half of the 3rd and the 2nd century B.C., i.e. when the "Corpus Hippocraticum" formed and it too was eliminated in Christian times, i.e. between the 4th and the 5th century A.D. for the above mentioned motives. We are well aware that these are nothing but hypotheses. Nonetheless we believe that they may be considered as supported enough by both internal and external evidences, although we cannot avoid agreeing with Jones that "the interest of the "Oath" does not lie in its baffling problems" and that although "these may never be solved... the little document is nevertheless a priceless possession. Here we have committed to writing those noble rules, loyal obedience to which has raised the calling of a physician to be the highest of all the professions". 1. - History Office, European Association of Urology. I dedicate also this article to the memory of my adored son Giulio, who was killed y a criminal river, who did not observe a STOP sign, on 14/05/2012. 4. - We feel bound to express our gratitude to Prof. Dr. Rainer Engel, who has let us have Jones' and Edelstein's fundamental contributions at our disposal. 5. - Cf. H. E. Sigerist, A History of Medicine, New York, Oxford Unversity Press, 1961, II, p. 304. 6. - Cf. W.H.S. Jones, Hippocrates, etc (cf. reference n. 1); I, 296; S. Musitelli, Comment on the article "Operative Urology and the Hippocratic Oath", in De Historia Urologiae Europaeae Drukkerij Gelderland, Arnhem, IX (2002), p. 163 ff. ; S. Musitelli & J.F. Felderhof, Castration from Mesopotamia to the XVI century, in De Historia Urologiae Europaeae , Drukkerij Gelderland, Arnhem, X (2003), p. 112 ff. 7. - Laurentianus 73,40 ; Leydensis B.P.L. 156; Bernensis 131; Vindobonensis 4772 and Basileensis E III 15. 9. - He was the founder of the School of the so-called "Methodists"
10. - Cf. H. E. Sigerist, A History of Medicine, etc. II, 304; W.H.S. Jones, The Doctor's Oath, etc. Cambridge, 1924, p. 23. 11. - The text has been, so to say, "Christianized": in the Latin translations the pagan Gods have disappeared and the first lines read as follows: "From the Oath according to Hippocrates in so far as a Christian my swear it. Blessed God the Father of our Lord Jesus Christ, who is blessed for ever and ever. I lie not". Cf. Hippocrtes, etc, I, 296. [1.] "Hippocrates with an English translation by W.H. Jones, William Heinemann ltd, London - Harvard University Press, Cambridge Massachusetts, 1957, I, 291. [2.] W. H. S. Jones, The Doctor's Oath - An essay in the History of Medicine, Cambridge, at the University Press, 1924. [3.] L. Edelstein, The Hippocratic Oath, Baltimore, The John Opkins Press, 1943. [4.] H.E. Sigerist, A History of Medicine, New York, Oxford University Press, 1961, II, p.304. [5.] S. Musitelli, The first Universities, in Europe - the cradle of Urology, History Office of the European Association of Urology, Arnhem, 2010. [6.] S. Musitelli: Comment to the article "Operative Urology and the Hippocratic Oath" in De Historia Urologiae Europaeae, Drukkerij Gelderland, Arnhem, IX (2002), 163 ff. [7.] S. Musitelli & J.F. Felderhof: Castration from Mesopotamia to the XVI century, in De Historia Urologiae Europaeae, Drukkerij Gelderland, Arnhem, X (2003), 112 ff. [8.] L. Edelstein, in The Oxford Classical Dictionary, Oxford, at the Clarendon Press, 1953, entry Hippocrates. [9.] Cf. S. Musitelli, Hippocratic Oath during the Middle Ages, in IHFK Bulletin, Vol.3, 1994, p. 3 ff.